This label really impresses me : after Accomplice (surprise of metalreviews.com recently), here comes another wonderful band called Aztec Jade. The tittle Paradise Lost has given me this image : "Here comes a new gothic metal band". No, no, no, not at all. 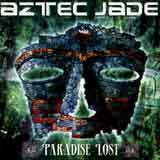 Aztec Jade is playing melodic hard rock with some prog elements here and there and it ... rocks. Nothing really new, but the song-writting is good (nice chorus) and the singer really knows how to activate the attention of the listener. Of course we cannot say those guys are following the trend and they will need lot's of pearls like this one to wake up the hard rock kids out there. But with songs like Regatta Fugue Part 1 (what an opener !) all fans of Marillion can jump on this one ... blindly. Now I should say it is a "power-metal" Marillion's influenced band and they need to "digest" that, but overall this is a very catchy album, full of melody. A bit too long may be (17 songs - 73'10 !) as Aztec Jade should have kept their best songs only. Anyway, this is again a nice surprise from Adrenaline Records.